How Jeremy Corbyn would react to one of my magic tricks, whilst standing on my staging ... maybe. What I've done this year in the workshop is to have devised a better way of getting wheelchairs on stage. It's always been a bit unfair that people in wheelchairs either don't really get the opportunity to go on stage or they have to be lifted up. So here we have it. I've sorted out the leg heights and some safety rails, plus some extra securing, and you can now get up there safely, as can any vehicle. For all the details go to www.stage-trailer.org.uk. "A little bit of magic." 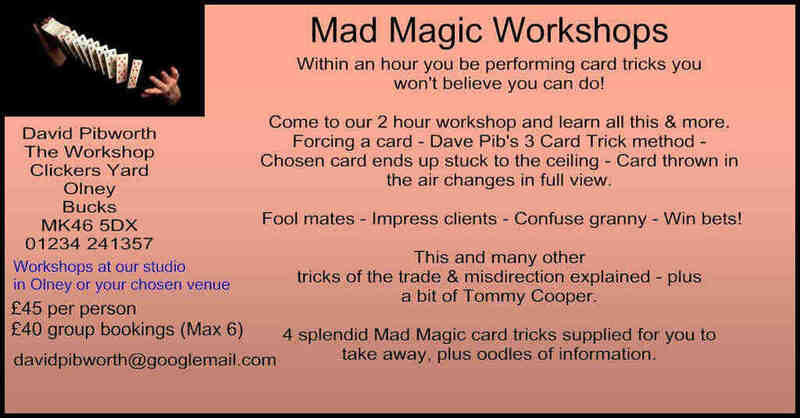 Also while it's been a bit quieter, I've sorted out the magic website at www.magicandmore.co.uk. I'll be adding to it as we have quite a bit of magic equipment to put on there, so do keep coming back if you're interested. I've also put up some magic videos on my YouTube page which I'll be adding to over time so you can see how they are performed. You'll have to buy the tricks to get access to the video of how to do them or come to one of my workshops. "And finally, for this week." One of my Labour supporting friends emailed me the other day and asked me how to get Mr Corbyn into number 10. Now, I can change water into wine, push a playing card through a window, but I'm still scratching my head on that one. Whichever lot win it'll all be smoke and mirrors, and that's for certain.